The brain must be changed before any rational influence on change (treatment) can truly succeed. Most rehabs do not truly fix neurophysiology of addiction at its core. At Grey Matters International we take mental health recovery solutions to a whole new level. For all those whom have struggled with mental health matters stemming from alcoholism, substance abuse, depression, co-occurring disorders and so on, the treatment options often entail lifelong changes in lifestyle or acceptance of the fact that you can never truly live the life you want or the life you’ve always envisioned. You have spent years struggling with any number of life-changing, family-shattering, career-ending situations that seem to have no possibility for true resolution. You may be the one who has spent hundreds of thousands on world renowned treatment, only to have each attempt at quality sobriety stripped away by a yet worse relapse than the previous one. The clean time was there but the need to attain true joy and freedom from the racing addict mind just never quite materializes. The thought of living the life you dreamed of as a job just seems so distant, and that doesn’t have to be! all-access, 24/7 private coaching by Dr. Fleming for maximal availability and influence—-for life happens always in real time, not on some weekly appointment basis. Neuroscience. Innovation. Personal concierge-level care and customization. Done wherever you want your care. 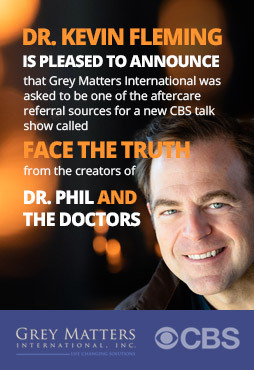 With Grey Matters International, finally addiction resolution is science-based, lasting and effective.